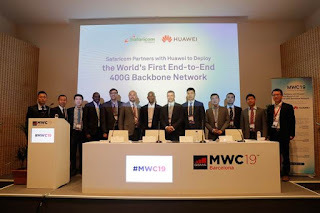 At MWC 2019, Kenya's leading telecom operator Safaricom announced that it would select Huawei's end-to-end 400G solution for its next-generation backbone network. This is the world's first commercial 400G project, advancing backbone network deployment towards the 400G era. Safaricom is the leading service provider in Kenya with over 29.5 million subscribers, 22 million mobile money customers, 17.6 million data subs, 15,000 enterprise customers and over 220K FTTH homes passed. In 2018, its broadband users grew by 2.5-fold, and its mobile and fixed network traffic are estimated to increase by 6-fold and 5-fold, respectively, over the next three years. This will require modernization of the existing equipment to accommodate capacity requirements. The 400G backbone will replace Safaricom’s existing 100G backbone increasing the capacity of network traffic carried between Mombasa, Nairobi and Kisumu. Through the solution, Safaricom seeks to meet growing data consumption from its customers resulting from the expansion of its fiber to the home and enterprise fiber networks. The firm has also been experiencing a year-on-year doubling of mobile data usage on its network. To deal with increasing data traffic over the next decade and maximize network value, Safaricom selected Huawei's end-to-end 400G solution. The ultimate goal is to further improve network reliability automation, and optimize user experiences. The innovative end-to-end IP+optical 400G network will be built using Huawei's backbone router and optical transport network (OTN) platform. The backbone router provides ultra-large capacity of up to 400GE per port, helping Safaricom deal with the increasing traffic on its backbone networks. The OTN with 400G technologies doubles the transmission capacity per fiber, reducing fiber rental costs on the backbone. With fast reroute (FRR) and automatically switched optical network (ASON) technologies, the 400G solution can enable protection switching in milliseconds, guaranteeing the network reliability required by delay sensitive services like mobile money. "We believe 400G will play a major role in increasing the capacity of backbone networks," said Safaricom CTO Thibaud Rerolle. "Huawei's end-to-end 400G solution coordinates router and WDM planning and maximizes network value. It will help us fully utilize network resources, and optimize the forwarding cost per bit while ensuring high reliability. Our aim is to offer faster, more innovative, and higher-quality services to our customers." "We are delighted that Safaricom has selected Huawei to deploy the world's first end-to-end 400G backbone network, which will redefine backbone networks in the intelligent world," said Jeffrey Gao, President of Huawei Router & Carrier Ethernet Product Line. "Huawei has played an active role in advancing the 400G industry, and has invested heavily in NP chips support 400GE port, high-speed optical digital signal processors (ODSPs), and backbone network standards and products. Built on 400G ultra-high bandwidth, Huawei backbone networks will address service uncertainties and lead the development of the backbone industry. This will help our customers maximize their network value." Huawei's backbone routers serve multiple industry-leading operators over 100 countries and regions. Moving forward, Huawei will team up with industry players and customers and continue to innovate and invest in the backbone field. Together, they are working to help operators and enterprises achieve business success in the intelligent era.